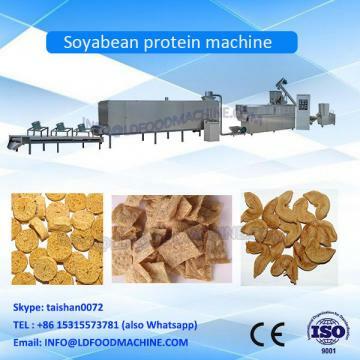 1.Textured Soya Protein Food Processing Line/Machine is developed and manufactured on base of our experience combined with the advanced machines from foreign countries. 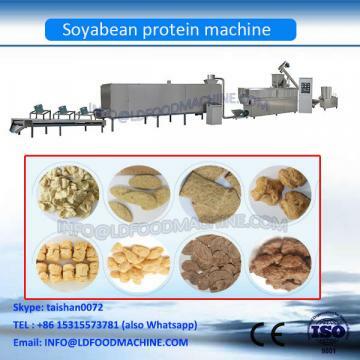 2.This Textured Soya Protein Food Processing Line/Machine takes soya bean dregs and peanut dregs as main raw materials. After milling, mixing, extruding and cutting, the dregs become layer fiber structure. 3.The finished products has high nutrition,looks and tastes like meat, easy to absorbing oil, water and smell, without cholesterol and animal fat, so it is used in meat products industry, fast food production, deepfreeze food production, and all kinds of maigre snacks and food. wooden box for packing.saibainuo technology company is available to fix,stable and loading the equipments for you. Saibainuo is a soy isolated protein production machine manufacturer of high quality twin screw and single screw extruders for food industries.We have almost ten years'experience of working with our customers providing specialist designs and practical solutions for a wide range of process needs.We have been supplying the most efficient equipment available to snacks food manufactures around the world.A comprehensive range from mixers to extruders,ovens ,flavors offers various tastes and easy to operate designs which lead the industry. If you have any question related to the production line,please feel free to ask me.I'm available to answer all your question.